Kitchen trends are ever changing, there is always a new colour, a new product, a new design that is taking the interiors world by storm. So how do you keep up to date with what’s new and current in the global design world? Kaboodle kitchen has launched its latest trends range, and it covers everything you need to know for a modern and timeless kitchen design. Introducing six new colours to its collection of doors and panels, the range features matt black, smoked grey, a rich green, deep navy and two concrete looks. Bold kitchen colours have made headlines in the interior design world with designers and consumers alike making brave choices for that stand out kitchen. Kaboodle’s Vivid Basil is a rich green that brings out an eclectic elegance. The perfect choice for those who like bold design, have a passion for striking interiors and want to make a statement. 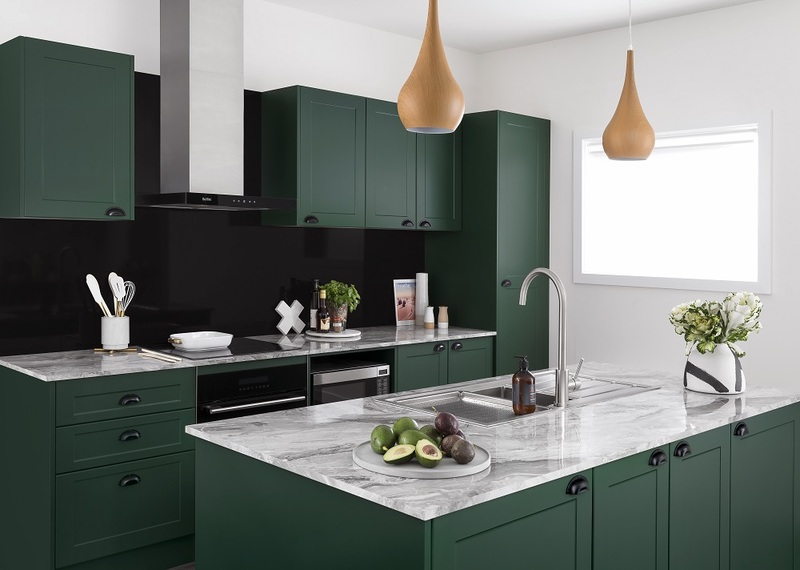 Over the past few months I have seen green pop up in kitchen designs in various shades, from pastel and mint, to neon and forest – it’s a colour that can work in many settings. Another interior colour that’s making waves is navy – the perfect choice for an elegant but bold look. Kaboodle’s Bluepea is a dark and inky navy blue, the perfect alternative to black or charcoal if you are wanting to take a step away from the safety of neutral tones. Team your navy cabinetry with a patterned tile for a modern edge, or keep it minimal with sleek stone-look bench tops and a matching splashback. My favourite kitchen look for navy cabinetry is pairing it with a marble bench top and touches of brass, a super luxe look but still very classic overall. A huge trend that seems to be here to stay is black – and that’s exactly what I’ve chosen for my own new kitchen - I’ve been waiting to design a black kitchen for so long! Black is the perfect choice for those wanting to take their kitchen to the next level and stand out from the crowd, and using a matt black will make even more of a statement. A modern and minimalist option is Kaboodle’s new Molasses V - it is the perfect choice for lovers of monochrome design, and is made even more impressive with its anti-fingerprint technology and soft touch matt finish. Forever timeless, black never fails to make a striking statement. Grey is trending in a huge way … and it looks like it’s here to stay. The great thing about grey is that there are literally 100’s of greys to choose from, which can be great but also daunting. So if you’re after a modern/industrial feel with a textured and tactile finish that is perfectly on trend, try Kaboodle’s Light Truffle. This industrial textured look demands attention thanks to its raw finish and modern aesthetic, giving the impression of real concrete. If you feel as though grey could be a little bit too ‘cool’ in tone for you, pair it with natural finishes, such as timber bench-tops to warm it up and add a tactile element. And for those lovers of grey, another trend-driven look is the ever popular ‘Scandi’! Pale grey is classic, refined and super on trend in the kitchen design world. Kaboodle’s Smoked Grey is versatile, timeless, contemporary and also offers a very sleek finish that can be adjusted to suit your level of ‘scandi’. Go full on scandi vibes with white bench-tops and pale white washed floors, or for just a hint use deeper tones with your grey to anchor it and create depth. Luxury is always trending, especially in the design world. To achieve a luxurious look and feel in the kitchen, try Kaboodle’s new Dark Truffle, a dark concrete shade complete with a unique textured look. Add a touch of luxury with its smokey velvety undertones and pair it with whites, light timbers, subtle grey or metallic for an especially modern finish. I am a lover of dark cabinetry in the right space – if you are thinking of designing a darker kitchen, ensure you have enough natural light to balance the cabinetry, and ensure that your surrounding features such as wall colour and flooring will complement it. Designed and manufactured in Italy, The Multitap3N1™ is the latest and greatest instant hot water tap to come onto the market. Not only is it super convenient as it dispenses hot, steaming hot and cool water, it is also super stylish and the perfect addition to your kitchen! We had heard many great things about the Multitap3N1, so when we were approached to review it of course we jumped at the chance. As we are currently in the middle of building our new house I unfortunately couldn’t install it in our kitchen, however my gorgeous sister in law Celeste was the lucky one and received a brand new Multitap3N1 (and yes, I’m totally jealous!) - read our review below! The Multitap3N1 comes in three different shapes and two colours, meaning there is a style to suit everyone’s kitchen space. Celeste chose to install the classic ‘L shape’ in chrome to match her contemporary kitchen design and she couldn’t be happier with how it looks. The Multitap has three clever functions in the one tap, cool, hot and steaming hot water - with the last function removing the need for a kettle on your bench, which free’s up valuable bench space and saves so much time, no more waiting for the kettle to boil! Before deciding whether to have a MultiTap installed Celeste researched the under bench tank size - because as we all know, storage is always an issue in kitchens. She was very happy to find out that the tank has an extremely small foot print, it hangs on the internal wall of the under-sink cupboard, conserving as much space as possible - the unit size is approx. 310mm H x 157mm W x 206mm D.
The 2.5L tank capacity allows you to heat only what you need while conserving energy for environmental stewardship. The cupboard does not require ventilation as this is done through the spout which makes installing your Multitap3N1 hassle free and you can also adjust the heat settings, up to 98 degrees celsius. With a toddler on the loose Celeste was interested in the safety features of the Multitap3N1 and we were both very happy to learn that the MultiTap has a built in safety mechanism. To access the steaming hot water you must use your left hand to push down on the lever and then pull it towards you, then as soon as you let go of the lever it flicks automatically back into the upright position stopping the flow of steaming hot water. An extra safety feature is that the flow of the steaming hot water is also at a much slower rate in comparison to the cold water. Overall the Multitap3N1™ is super functional, stylishly designed and makes day to day life just that little bit easier! For more info and specifications head to the Multitap3N1™ website here. With modern kitchen trends focusing on de-cluttering the kitchen sink, Zip Water introduces the beautifully designed Zip HydroTap® All-In-One ARC design which now delivers all home water needs from a single tap. The new design is a result of overwhelming demand from Zip Water customers wanting a product that delivers all – instant filtered, boiling, chilled and sparkling water, combined with a regular mixer tap with unfiltered hot and cold-water options - perfect for washing up. With advanced energy efficiency and best-in-class cooling technology, the Zip HydroTap® All-in-One ARC also performs to the highest standards of environmental responsibility and sustainability. Unlike water-cooled systems, its air-cooled ventilation system doesn’t use precious water during the cooling process, instantly quenching your thirst while doing its bit to help the planet. It has also been announced that the new Zip Water HydroTap® All-In-One ARC has been awarded a Good Design Award for Product Design in the 2017 Good Design Awards in Sydney this month. Every Zip HydroTap® also comes with a 3-year warranty supported by Australia’s largest company-owned installation and service team. When water is this irresistible, it’s easier than ever to drink more and improve your wellbeing, health and happiness.